In real estate, everyone needs money. It doesn't really matter if this money comes from recent closings, working a day job, or whatever. But it's monumentally important that you have at least one income stream which can help you with getting your business to the next level - via more advertising, better photography, etc. One specific income stream which can be helpful to newer and seasoned agents alike, is referrals. Want Free Access to Our Ultimate Real Estate Pocket Listing Platform? Now, I'm not talking about "word-of-mouth" referrals to get buyers and/or motivated home sellers, I'm talking about agent-to-agent referrals. What is a "Buyer Referral"? 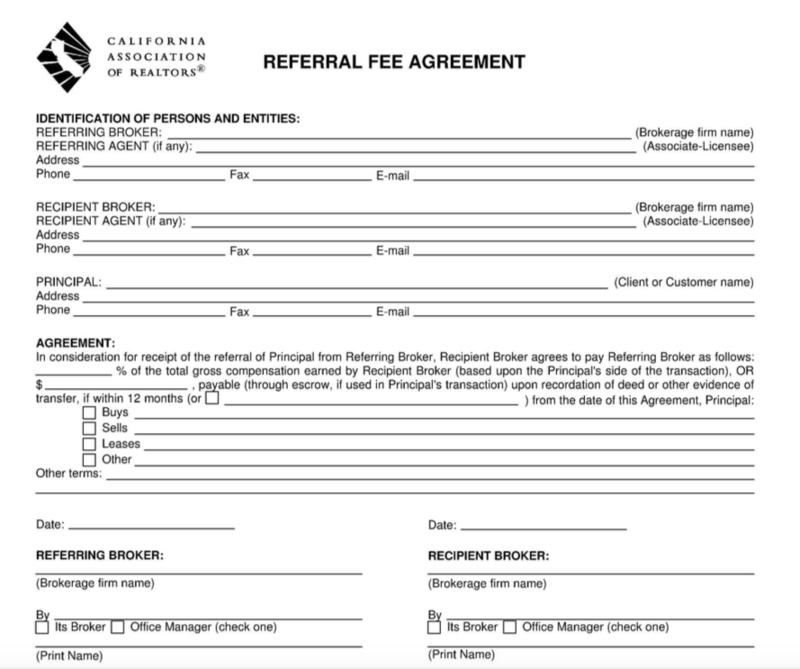 A buyer referral stems off of the Referral Fee Agreement. It's a form which basically allows you to "step-in" between two parties in a transaction. In this scenario, you are basically providing information to either the buy side of the transaction or the sell side of the transaction in the form of bringing a buyer (who is already represented by another agent) to a property which is for sale (which is also being represented by an agent). Since the above potential transaction already has two agents involved, you are stepping-in to connect the two parties together. In exchange for referring the parties to one-another, you collect a fee. Inner-office referrals are basically referrals you can get from agents in your office. Agents in your office most always have either a buyer looking or a pocket listing. Depending on your office setup/technology, your office may or may not have an internal system for matching buyers and sellers together. If they do not, then this is a great opportunity for you. Now, why would you want to start that yourself? Because, if you become the leader of putting together a system for matching buyers and sellers within your office, you will become the go-to-agent for all the secret off-market listings and buyers. Furthermore, YOU will be the one who learns about them first. Don't be afraid to open up the dialogue with your office manager or lead broker about the advantages of having such a system in place. Also, don't be afraid of putting in the work to get it up-and-running as well as training other agents in your office about how to use it. Remember, consistency is the key!! Referring new agents into your brokerage is a very well-known way to generate passive income. In fact, Keller Williams built their entire business on this strategy! If you refer an agent into Keller Williams and they signup and name you as a "referrer", then you earn a portion of every commission they make with the company. Also, the program is "tiered", meaning that if the new agent signs on ANOTHER agent to the brokerage, you also get a portion of their commission too. Now keep in mind, you are not taking commission away from these agents, rather the brokerage is paying you extra money from their own pocket to cover your referral fee - so no one loses in this scenario! What is the office policy on getting new agent referrals? If we don't have a program, how can we start one? A few words also about mentoring a newer agent.. This is a fantastic way to build your team for future expansion. The idea of brining on agents and mentoring them, not only benefits you from a referral standpoint, but it also means that you are slowly building out a team which you can trust. Later on, these mentorees will become a crucial part in your plans for rapid expansion in your real estate business. Most larger brokerages out there have some sort of Commercial division. The key is that you want to find out EVERYTHING about your Commercial division in terms of what areas do they normally sell/buy in, what they're current buyer and seller needs are, etc. Most importantly, you want to find out: What is their referral fee? In California, it's usually around 25%, however this varies from State to State and from brokerage to brokerage. Present real estate investment opportunities for your clients. Introduce OTHER agent's clients to your Commercial division. The referral fees on Commercial property and even Multifamily property can be quite substantial. I would encourage you to learn everything you can about the process, assuming your don't already have your Commercial broker's license. Don't make the mistake of ignoring this lucrative area of the real estate market. What Do I Do With This Information?? Now that you've gotten organized with a wealth of information at your fingertips regarding off-market properties, qualified buyer needs, commercial and multifamily inventory, etc. How can you use this information in other ways? Well, we all know the old cliche' that knowlege is power. I like to think of it more as a tool for leverage..
You see, there are still agents out there who are NOT technically savvy (shocking, I know), or who don't have the drive and ambition to put all this information together. This can work to your advantage in several ways.. Remember, that not EVERY agent will agree to do these types of referrals - in fact, some will just give you a flat out "no". That's fine. Because we don't stop when this happens, we just change the leverage we have and form another type of exchange between the agent so we can still gain some benefit. For example, if you have a pocket listing that you know of and you happen to NEED another pocket listing for one of your buyers, then trade your pocket-listing information for the another pocket listing from another agent. Now, since this type of information exchange is not really documented well, you need to be cautious; and I'll leave it up to you to decide if it's worth the risk vs. reward. In any case, after doing these types of information exchanges a few times, you will start to build a trusted circle of agents around you who are willing to exchange information with you to help close deals...and as the years go by, your network will continue to grow and produce for you. Lastly, you what to always keep this information organized and at your fingertips; i.e., make it accessible via your phone. There are a ton of CRM's out there which can help you accomplish this. We use Zoho CRM, but you can use even a Google Spreadsheet on your phone if it's more comfortable to you. The point is that eventually you will need to come up with a buyer need or a pocket listing on the spot. Either you're at a showing, or an open house or whatever and you meet someone very important to taking you business to the next level - you WANT to impress them by your wealth of information available to you. Information will give you a huge boost of credibility almost instantly. So keep it close to you and readily accessible. Like any system, you must continually update and improve it. This means that if you are spending 4 hours a day putting together referrals, then figure out a way to cut that time down to 2 hours, etc. When you start to experience some success with this system, either in closing more deals (later) or gaining a wealth of knowlege regarding off-market properties in your area - people will start asking you questions. Most of them will have good intentions, but some will not. It's best to remain a little mysterious in your business and not spill the beans on everything you have going on. The last thing you want to happen is for you to give up all the information and remove yourself as the go-to agent in your office. Since this system deals very much with pocket listings, it's obvious that you want to be careful about who you trust with this information. If you haven't worked with a specific agent in the past and have no idea of their track record (in terms of ethics), then it's probably a good idea not to share pockets with them. Also, be careful about giving away information without getting something in return. It's easy to become the "nice agent" in the office who helps everyone else succeed, but you have to remember that YOUR business is the number one business you need to grow first. Patience. Persistence. Those are keys to success in this business. Build a foundation, stay consistent and you will see results - just not right away. Remember, the first 2-3 months are the hardest. Stay with it and make this year your most productive year yet! How the #DeleteFacebook movement affects Realtors. Facebook's latest data breach has more than a few users uneasy about their personal data - but how will it affect realtors? The housing market continues to heat up and sellers are hoping to cash-in on the frenzy. Here are a few ways to increase the value of your home.